1Ghz x86 or compatible processor; 512MB RAM; 32 bit and 64 bit versions of Windows 8, Windows 7 (SP1 included), Windows Vista, Windows XP and Windows 2000 Professional; Mouse; Keyboard. The main problem with any Free software application is that half of its features are disabled, Right? Actually, in the case of Aomei Partition Assistant Home Edition, you would be totally wrong. There isn't one feature that is disabled. Everything you see, you can use without limitation. As a partitioning tool Aomei Partition Assistant Home Edition is easy to use, providing more than enough functionality for the average user. Okay, it doesn't have an undelete partition option and it doesn't support dynamic disks, but for the average user this is no great pitfall. And if this version doesn't provide you with enough features there is always the paid for version of Partition Assistant Home Edition 4 Professional or Partition Assistant Home 4 Server Edition. You may say that Window has its own partitioning application already build in, so why get another? Well yes it does, but, sadly the Windows partitioning application leaves a lot to be desired. So much so that you are better off using a third party partitioning application in the event you need to do any major partitioning work on your hard drive. Aomei Partition Assistant Home Edition has an extremely uncluttered user interface and supports flash drives, memory cards, hard disks, virtual disks in VMware, Virtualbox and Virtual PC, RAID array and disks up to a maximum of 4TB on 32/64 bit versions of Windows 8/7/Vista/XP and 2000 Professional. An interesting point with this free version of Partition Assistant Home Edition is that it is also not restricted to single personal use; the developer also allows the software to be used in a commercial environment too without limitation. This is probably a first for any application billed as being totally free. 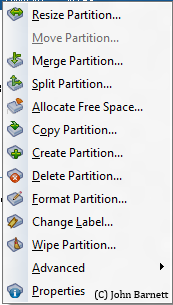 Partition Assistant Home Edition doesn't have any complex menus; instead everything is set up to be as easy as possible, so even someone with the least knowledge can quickly start to make changes to their partition structure. From within the application's Partition tab it is a simple task to Resize, Move, Merge, Split, Copy, Create, Delete, Format and Wipe a partition. There is even an additional advanced option which allows the user to quickly Change drive letters, Hide Partitions, Set active partition, Convert a FAT drive/partition to NTFS, Check partition and Wipe data from a partition. 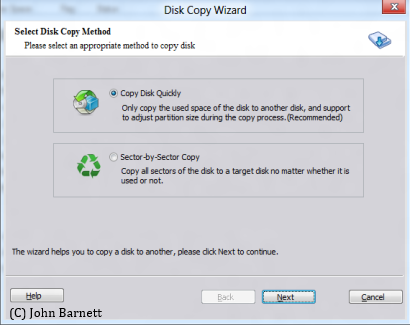 Further options are available from the Disk tab where you can Copy disk, for migrating Windows system and data, Delete all partitions, Wipe the hard drive and Test the surface of your hard drive. Partitioning is an essential part of disk management, but to compliment this it is important that each partition is regularly checked to ensure there are no surface defects on the drive/partition. Partition Assistant Home Edition allows you to quickly and easily check for surface defects by running a surface test. 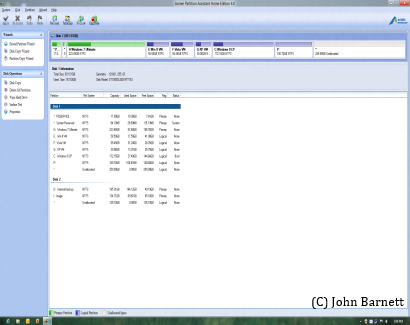 From within the test interface the user can choose to either run Windows Check Disk (chkdsk) or a complete disk surface scan to highlight any bad surface sectors. The length of time that this surface test takes to run will be dependent upon the size of the relevant drive/partition. For the more complex procedures, such as Disk Copy, Partition Copy and extend Partition, Partition Assistant has a set of wizards which guide the user quickly through the relevant procedure. These too are easy to comprehend and master. The user can choose either a quick copy, where only data is copied, or a sector by sector copy which includes all free space. Aomei Partition Assistant Home Edition is one of the only partition applications that's free for both personal and commercial use. It is easy to use and, surprisingly, for a free application, packs quite a punch. It is somewhat disappointing that Partition Assistant Home Edition 4 doesn't have a bootable recovery disk or, for that matter, an undelete partition option, but for something that is totally free there has, we suppose, to be some restrictions. If you are looking for something more advanced than the built in Windows partitioning application you couldn't choose anything any better, for free, anywhere! This software is well worth having.